Christmas is a big day that must be welcomed by all Christians throughout the world. Christmas must be celebrated with various activities such as gathering with family, decorating Christmas trees, and exchanging gifts. All ages will exchange gifts with the people they care about. As an expression of love and happiness on Christmas day. Every country certainly has its own way to celebrate Christmas. How to celebrate Christmas can also be considered a tradition. Likewise with Russia. Russia also celebrates Christmas by sharing gifts and decorating Christmas trees. However, Christmas gifts that are popular in Russia are certainly different from Christmas gifts that are popular in other countries. Russia has a variety of cultural heritage that is very unique if used as a Christmas gift. Lots of typical Russian items that can be given to old, young, or children. All Christians are happy to welcome Christmas, especially children. Children always hope to get a special present on Christmas. If you want to prepare a Christmas gift, but are still confused what gift is most suitable for children, then Christmas gifts that are popular in Russia can be your choice. When you visit Russia, or celebrate Christmas in Russia, take the time to buy special gifts for your family who are still children. Whether it’s your sister, your niece, or your neighbor. Making happy children is certainly very easy, right? In this article, we will present some Christmas gifts that are popular in Russia for children. You can choose the one you like the most. The following are 6 popular christmas gifts in Russia for children. The first Christmas gift that is very popular in Russia and you can make it as an option is a wooden doll. Bogorodskaya toys are toys in the form of animal figures such as rabbits, bears or birds, and also people made of carved wood. This mini wooden doll performs various activities, such as pecking chickens, bears cutting wood, and rabbits playing musical instruments. The way to play is by gently wiggling the wooden doll, so that the chicken can peck the seeds, or the bear can cut wood. A very unique and funny toy! Bogorkaya toy is very good for children as an educational medium. These toys can help develop children’s motor skills. Isn’t it better if you give a useful toy? This wooden doll has been known since the 17th century. According to legend this toy was made to entertain poor peasant children in a small village, Bogorodskoe. And then they sold it to the night market and were liked by many people. And since then this toy has become famous and preserved. If you are interested in buying this wooden doll, you can get it at Sergiev Poisad, Izmailovo Market, or other souvenir shops. The price is also quite affordable, around $ 13- $ 30. Children will definitely be very happy to get this Bogorodskaya Christmas gift wooden toy. This wooden doll is always popular with children and adults alike. Matryoshka is a wooden doll that resembles a fat and beautiful woman like a mother, using typical Russian clothes. matryoshka is a nesting doll that can have 4 children at least and 32 children at most with smaller sizes. All dolls with a reduced size can be one, in a larger doll’s body. Matryoshka is a children’s favorite because of its cute shapes and pictures. And this wooden doll is like describing the figure of mother and children. Matryoshka has also grown with various characters. Like the presidents and athletes. Matryoshka dolls are very easy to find in Russia. This doll is sold at prices that vary according to quality and size. Matryoshka is sold at prices ranging from 150-4,000 rubles. You certainly know that children’s favorite food is everything sweet. Not only objects, you can also provide food as a Christmas present. Russian chocolate and sweets are very popular for children. There are many kinds of chocolate, sweets and cakes in Russia. When you do a tour in Russia, you should not miss to taste or buy chocolate and Russian candy as souvenirs, it tastes very delicious. The most popular and most popular chocolate for children and even adults is Baranki. Namely ring-shaped chocolate rolls, very cute. In addition there are also soushki, pastila, and chocolate filling. Of course, children will really like this. Give them special Christmas gifts from you! Rostov enamel is very popular today in Russia. rostov enamel are various types of accessories such as earrings, brooches, necklaces, beautiful boxes, with miniature paintings on enamel. Rostov enamel has a variety of paintings and shapes. There are paintings of flowers, animals, and also Jesus. Of course, it is very suitable as a Christmas gift. And girls will be very happy to wear beautiful earrings and necklaces. They will be very grateful to you. The next special Christmas gift for sweet children is Valenki. Namely wool boots that are very popular among children. These shoes are used to warm the body during cold weather, like Christmas. But you might find it difficult to find in big cities. these shoes are widely available in the countryside. Valenki is plain and some have motifs, such as floral motifs. Valenki is made with attractive colors for children. If you see Ushanka, you will immediately be reminded of Russia. Ushanka is a typical Russian hat worn during winter. This hat is made of animal skin and fur such as sheep, rabbits, north pole fox, and musk rat. Ushanka is very suitable for use with Valenki. You can give Valenki and Ushanka for children as a Christmas present. They definitely like it very much, because the shape is unique and very warm. If you want to make Ushanka a Christmas gift, you have to pay around 11,000 to 22,000 rubles. The price of Ushanka depends on fur and also the model. You might find cheaper or more expensive ones. Children certainly love Christmas gifts that are interesting for them, or which they have never seen before. 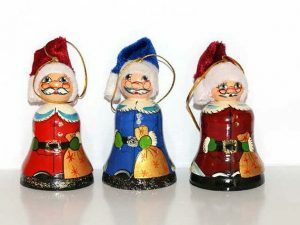 Therefore, you can make Russian souvenirs above as an option for Christmas gifts. You can choose it according to what you like. These souvenirs will definitely make children enjoy Christmas happily. Those are 6 popular christmas gifts in Russia for children. You will not disappoint children when you buy it. The souvenirs are also not difficult to find and affordable prices. Hopefully this article can help you find the best Christmas gift.